Because we know the value added when you build solutions into products up front, we created Design For Safety Approvals- DFSA®. Bring us in at the front-end. Save yourself lost time, money and customers by understanding the compliance requirements in detail before products come off the drawing board. Product evaluations are done earlier. Approval lead times are reduced from months to weeks. Costs associated with retooling are reduced or eliminated. Drawings can be developed with the appropriate specifications. 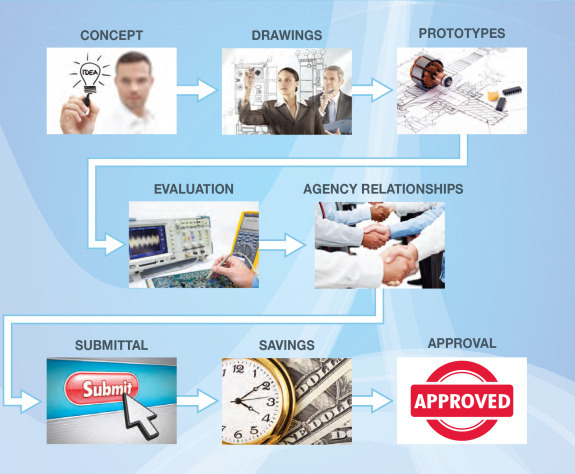 Concept sketches help determine appropriate standards and specify requirements. Prototypes are constructed closer to production to give more accurate results of preliminary testing for performance and safety. Engineers confirm construction issues such as spacing, wiring, and component placement for compliance. Results of safety and preliminary performance tests are more accurate. Additional tests confirm material temperature limits, ventilation needs and adequacy of over-current and over-temperature.